— In a bowl, mix all ingredients and form 12 patties. Place them on a baking sheet lined with parchment paper. Season the patties lightly and drizzle with olive oil. Bake for 45 minutes on the centre rack of the oven, turning the patties twice during cooking time. 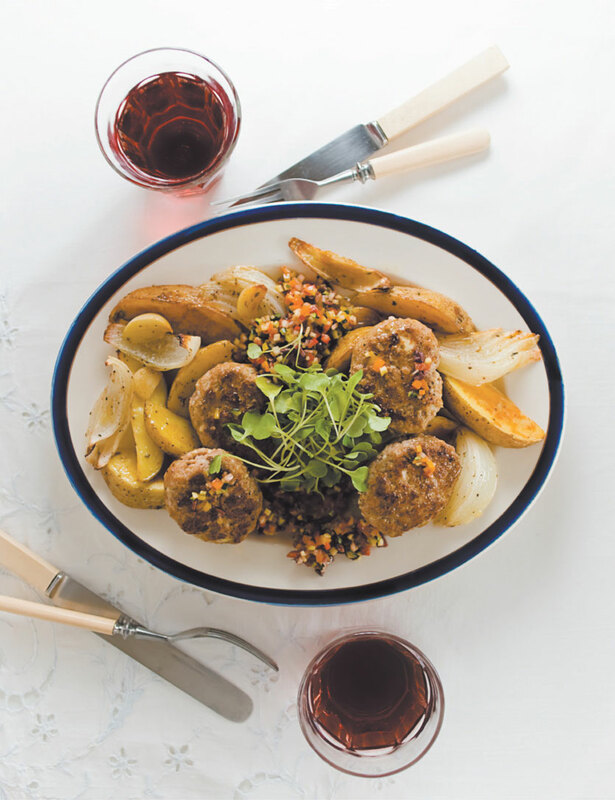 NOTE — The original version of this recipe combines the keftedes and Greek style potatoes. Place the raw patties on the potatoes; turn the meat and gently toss the potatoes half way through (cooking time remains at 45 minutes). Serve with a Greek salad. FINALE — Keftedes are delicious spread with some European salsa. Serve them with home made fries and a crisp green salad. TRICK — Prepare your hamburgers using this recipe; spread them with tirokafteri and add arugula leaves. It will be a big success!